There are a few thousand kinds of grapes with very different chemical composition. Grapes are 65-85% water, 10-33% sugar (glucose and fructose), phlobaphene, gallic acid, silicic acid, quercetine, anin, glucosides - mono delphinidin and delphinidin, fruit acids, like apple acid, salicilic acid, phosphoric acid, lemon acid, amber acid, formic acid and a little bit of oxalic acid, pectins, tannic substances, salts of potassium, magnesium, calcium, manganese, cobalt, iron and vitamins B1, B2,В6, В12, А, С, Р, РР, K, folic acid and enzimes. Grape skin has tannic substances and essential oils. Grape seeds have tannic substances, phlobaphene, lecithin, vanilla and fatty oil. Grape leaves have sugar, quercetine, carotene, inosite, tannic substances, betain, tartaric acid, apple acid, ascorbic acid, protocatechine acid, potassium, sodium, iron and silicon. Grapes have been used for treating metabolism disorders, liver, kidney and lung disorders and cardiovascular problems. Grapes improve metabolism and have diuretic, anti inflammation, light laxative and inducing perspiration effect. 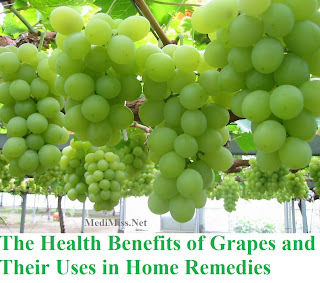 It is recommended to include grapes in your diet in the first stage of tuberculosis. Drinking grape juice daily for a long time helps to lower high blood pressure. 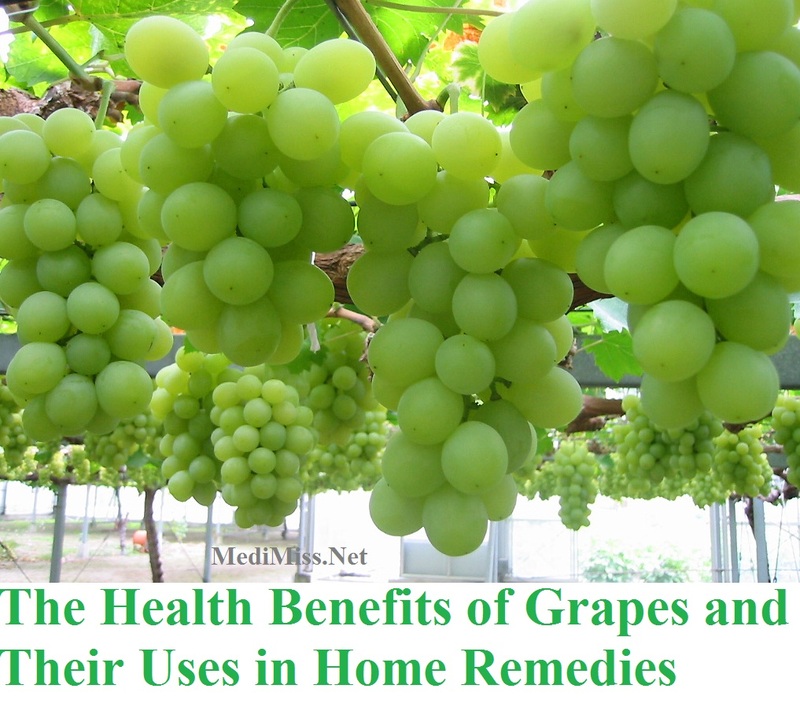 There many grape home remedies in folk medicine. Extract of grape leaves (boil 1 part of grape leaves with 10 parts of water for 15 minutes, let it cool and filter it ) is used for gargling your throat if you have angina and for washing your body if you have skin disorders. You should eat raisins, if you cough, have an angina, ulcers in your mouth, bladder disorders and hemorrhoids. -Grapes and grape juice are not recommended for obesity, stomach ulcers, diabetes, colitis, diarrhea and dysentery. -You will get an upset stomach if you eat grapes with milk, cucumbers, melon, fish, beer, mineral water and fatty meals. -If you have a cavity in a tooth, eating grapes or drinking grape juice will intensify your tooth destruction. Rinse your mouth every time you eat grapes.